Are you still clinging to 2017’s Christmas tree? We don’t blame you. Weren’t we singing “O Christmas Tree” not two or three weeks ago? Now we’re supposed to toss it to the curb? Here are some ideas to make the most of that used-up Tannenbaum, both inside and outside! Picking a Christmas tree has become one of the most important December traditions. Think about your favourite festive movies – from A Christmas Story to National Lampoon’s Christmas Vacation, taking the family to the local lot or forest to get a tree is one of the most magical parts of the season. Sure, you might end up with soap in your mouth after or cut down a tree with a squirrel in it, but you had a ton of fun! 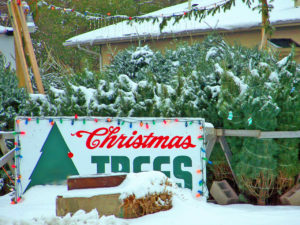 A new trend is quickly replacing the woodsy scent of real evergreens, though, as fake plastic Christmas trees are gaining in popularity. It’s understandable, really – it’s a one-time cost, there are no needles to clean up, and there’s nothing to haul out to the curb in January. But what do real tree specialists prefer? Winter can do a lot of damage to a tree. It’s a part of nature, really, and trees are built to resist much of what the cold, harsh weather will throw at them. Their whole system works to prevent the water inside from freezing and expanding, and their ability to go dormant in the winter helps them survive through a minus 30-degree day during the dead of a Canadian winter. Sometimes the weather wins. While that’s all well and good in a forest, you probably want to preserve the trees you have in your backyard. Winter damage can weaken the tree, make it aesthetically unpleasing, and even cause damage to your home or vehicles. Here’s what you can do to help to your trees survive the winter intact!